Slated for demolition in the '70s, South Station is now the second-busiest transportation center in New England and the gateway to Boston's revitalized financial and retail centers. 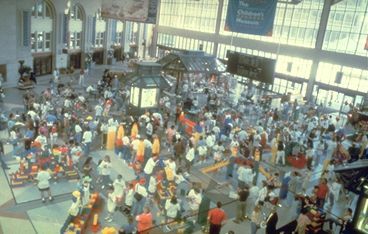 South Station reopened in 1989 after undergoing major renovation, the concept for which has successfully transformed a run-down terminal plagued with security problems into an active public amenity and focal point for the area around it. The renovation was funded through a three-way private/public partnership among the Massachusetts Bay Transportation Authority (MBTA) Commuter Rail, the owner of the Station; Amtrak, an anchor tenant; and Beacon South Station Associates (BSSA). Beacon Management Company manages the facility today. As a multi-modal transportation hub, the Station also hosts Red Line Subway service and long distance inter- and intra-city buses. Slated for demolition in the 1970s to make way for the new headquarters of an engineering firm, it was saved when the Head House (main building) was listed on the National Register of Historic Places and was renovated as a result of increasing transit ridership during the 1980s. It is now the second busiest transportation center in New England. The Station was restored to become an integral part of the City's patchwork of streets, parks, and public spaces. 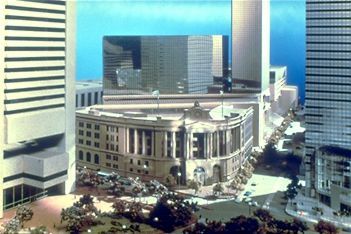 Unique design features include the only remaining double three-legged hand-wind clock mechanism in New England, in the style of London's Big Ben, and an eagle with an 8-foot wing span atop the building. Much of the interior is mahogany and polished brass; gas lights and Station signage were also restored. Four kiosks in the Grand Concourse camouflage ventilation shafts, wooden benches conjure images of historic train station decor, and there's ample additional seating in the Concourse and the food court mezzanine. Security was not a design issue for the renovated Station, given that there are now many more doors than before! It was improved primarily through increased presence of security personnel. 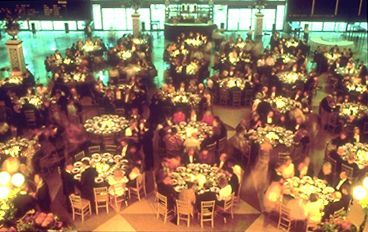 More than 50 events per year are hosted by the Beacon Management Company at South Station. On a daily basis, there are exhibits, concerts, fund-raisers, performers, musicians, ballroom dancing, family-oriented programming, and health-related activities such as blood pressure testing. These events draw more than 50,000 people annually and help to support the Station's 20 retailers. The community has been actively involved in running and advertising community-oriented special events and activities at the station. The Station serves tranportation needs and is also a market square and public gathering place where people could comfortably meet, eat, shop and mix. A five-story Neoclassical Revival-style building predating Grand Central and the old Penn Station in New York City, South Station was dedicated on New Year's Eve, 1898. For the next several decades, it was the busiest railroad station in the county, serving nearly 40 million passengers annually. 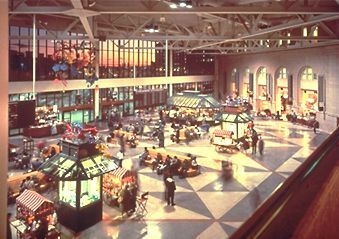 By the 1960s, however, South Station was dilapidated and virtually unused; it continued to function as a train facility for Amtrak and commuter rail with only one working elevator and one open staircase. In addition, the third floor had been closed after a fire and the fifth floor was completely abandoned. The desolate facility had become a haven for the homeless, which only served to exacerbate its negative image. Restoration began in 1983 and was completed in 1989 under the Northeast Corridor Improvement Project. Funded by the federal government, this $4.4 billion program paid for the renovation of Amtrak train stations from Washington, D.C. to Boston. Once somewhat isolated by its location, the revitalization of this part of downtown Boston has created over six million square feet of office space in the area surrounding the Station. Because South Station was in place, it provided a central focal point for the area and new developments have been orienting themselves around the Station. The restoration of South Station has been recognized with awards from the Boston Preservation Alliance, the National Commercial Builders Council, the International Council of Shopping Centers, and the Building Owners and Managers Association.